During the past 45 years, he has worked with Indigenous peoples from North, Central and South America, Micronesia, South East Asia, India, Hawaii and Africa. He served 16 years as an Associate Professor at the Faculty of Education at the University of Lethbridge, Alberta, Canada (1980-1996). With Elder’s from across North America Phil co-founded the Four Worlds International Institute (FWII) in 1982. FWII became an independent Institute in 1995. As well, Phil is Chairman of the Four Directions Corporation and First Nations Solar, Indigenous owned companies that serve as Four World’s economic development arm. With Phil’s guidance and applied experience, FWII has become an internationally recognized leader in human, community and organizational development because of the Institute’s unique focus on the importance of culture and spirituality in all elements of development. Four Directions’ is the Institute’s economic development arm. It is dedicated to the development of sustainable economic enterprises that support holistic, political, social, cultural, environmental, and educational development. His film credits include the award winning National Public Television series “Images of Indians” with the late Will Sampson, “Walking With Grandfather”, “The Honor of All: The Story of Alkali Lake”, “Healing the Hurts” and “Shift of the Ages (SOTA )”. Shift of the Ages is the story of Mayan Grand Elder Wandering Wolf and his inspiring mission to unify the human family towards peace on Mother Earth and the Reunion of the Condor, Quetzal and Condor. SOTA was released in December, 2012. In January, 2013 SOTA won the Jury Prize for Best Documentary at the World Interfaith Harmony Film Festival, in April, 2013 SOTA won the Audience Choice for Best Documentary at the Riverside International Film Festival and was the Official Selection at the Sedona International Film Festival in February, 2013 and the Black Hills International Film Festival in May, 2013. In August, 1992, Phil was the first Indigenous person to win the prestigious Windstar Award, presented annually by the late John Denver and the Windstar Foundation to a global citizen whose personal and professional life exemplifies commitment to a global perspective, operates with awareness of the spiritual dimension of human existence and demonstrates concrete actions of the benefit for humans and all living systems of the Earth. 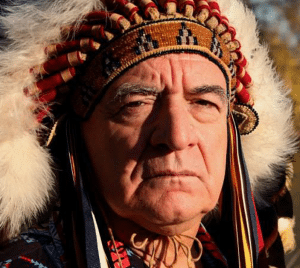 At this International event, in recognition of his lineage and longtime service to Indigenous Peoples and the Human Family, Indigenous Elders from across North America recognized Phil as a Hereditary Chief of the Ihanktonwan Dakota’s through a Traditional Headdress Ceremony. Other winners of these prestigious awards include, Oceanologist Jacques-Yves Cousteau, David Brower, Yevgeni Velikhov, Vice President of the Soviet Academy of Sciences, Wangari Maathai, Nobel Peace Prize Winner and founder of Kenya’s Greenbelt Movement, Lester Brown, President of the World Watch Institute, the Dalai Lama of Tibet, Dr. Boutros Boutros Ghali, former Secretary General of the United Nations, and British Lord Yehudi Menuhin, musician and philosopher. On June 21, 2008, Phil was awarded the 14th Annual Ally Award by the Center for Healing Racism in Houston, Texas. The Ally Award is an annual award presented by the Houston-based Center for the Healing of Racism to honor the achievements of those who have worked hard to achieve harmony of all ethnic and cultural groups. Phil received the Ally Award for his national and international work in promoting freedom and justice for Indigenous Peoples by building human and spiritual capacity that focuses on healing the root causes of racism and oppression rather than focusing on conflict. Special emphasis on this award is for Lane’s dedicated work, for more than nineteen years, as one of the primary leaders in the resolution of Canada’s Residential School issue, which involved the sexual, physical, cultural, psychological, and emotional abuse of thousands of Aboriginal Peoples in Canada.